Welcome back class! As we talked about last week after we finished up disclosures and Earnest Money, we’re tackling a huge portion of the contract today, Line Item 6, Titles & Surveys. There are several sub-sections to this portion of the contract, and we’ll touch on each briefly. And we’re off! In addition to identifying which party, buyer or seller, will pay for the title policy (it’s common for the seller to pay for the title policy), this area allows for specification of what is included in the title policy, and more recently, an option for buyers to amend the title policy following any survey issues. The Title Commitment is the document that spells out the owners’ rights to the property and other people’s rights to the property – for example, utility easements on a property, giving the city access to certain parts of your lot, or deed restrictions. This is also where any liens are identified, which protects both the buyer and seller. If the seller fails to resolve these issues, it is an out for the buyer, and the buyer will get their earnest money back if they terminate within the contract’s allowed time from receipt of the title commitment. It protects the seller in that it gives the seller time to resolve issues that are identified before the buyer can back out for that reason. Both the title company and the buyer’s lender will likely want a survey. The first box is most often checked unless both agents already know that the seller does not have a survey. Surveys are expensive – maybe $450 – $600 for a simple residential lot – and neither party wants to order the survey until some of the other hurdles are out of the way, like the inspection. Be sure to hold onto your survey if you are the buyer so that you can use it when you sell the home one day, and save yourself several hundred dollars. This section ensures that you can use the Property you are purchasing the way you intend to use it, single family residence, multi-family residence, etc. Also, if the buyer intends to build a pool, that would be specified here. 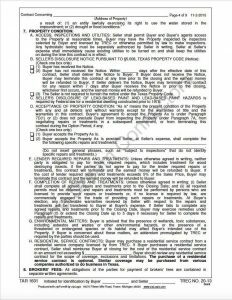 If for any reason the property couldn’t be used for the way stated in this section, for example, deed restrictions dictate no pools, the buyer can terminate the contract and receive their earnest money back. It’s in this section that a time frame is set for the buyer to identify any issues from the Title Commitment that would make the home unsuitable. Abstract or Title Policy – A buyer does not have to get a title policy, although it is a very good idea. This advises that if they choose not to, it is advised that they have an attorney review the chain of title for any issues that may affect their ownership. Membership in a Property Owners Association – a notification that the title commitment will address whether or not the home is in an HOA and ensure the buyer knows that failure to pay HOA fees can result in liens and foreclosure. Statutory Tax Districts – a notice that the buyer should ensure they’ve been informed by the seller of any special tax districts the property is a part of. Tide Waters – This is for coastal properties. Annexation – This just notifies the buyer that the home may eventually be annexed into a city’s limits if it is not within them already. Property Located in a Certificated Service Area of a Utility Service Provider – this applies to areas that are serviced not exclusively by a municipality’s utilities, but a private utility, usually away from the city. There may be additional costs to a property and utilities if this is the case, hence the notice if applicable. Public Improvement District – like historic districts for example, there may be other costs, regulations or restrictions related to living in certain neighborhoods. Transfer Fees – as of 2012, there cannot be transfer fees related to the property transaction, however agreements predating the change may still be in effect. The seller is obligated to notify the buyer of any such requirements. Propane Gas System Service Area – The seller must notify the buyer if the property is located in a propane gas system service area. If so, there is an addendum that will be completed as well by the seller. Notice of Water Level Fluctuations. If you’re next to a lake, the water level can change. YOU DID IT! You’ve mastered titles and surveys. Next up, inspections, repairs and home condition disclosures. It’s a nice change of pace that Gale and I think you’ll really enjoy!